DALLAS (January 15, 1974) * SR-50. This advanced slide-rule calculator with memory performed all the classical slide-rule functions including the SR-10's functions, universal powers and roots, factorials, trigonometric and hyperbolic functions and their inverses, common and natural logarithms and e(x). Scientific notation. It also featured a 14-character LED display and pi key. Direct-marketed initially at $169.95; later sold through dealers. © Texas Instruments, From "20 YEARS OF CONTEMPORARY HISTORY". 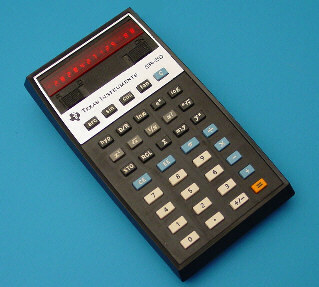 To celebrate the 30th anniversary of the wonderful SR-50 slide-rule calculator the Datamath Calculator Museum gives you one as a present! Compared to the old-fashioned original calculator this Windows™ compatible Datamath Commemorative replaces the 4-bit single-chip calculator circuit with Pentium™ power, lacks the acid NiCd rechargable batteries and features even an Online-Manual. Before downloading the SR-50 Commemorative Software read this chapter carefully. BY DOWNLOADING THE DATAMATH COMMEMORATIVE SOFTWARE, YOU AGREE TO THESE TERMS AND CONDITIONS. These terms and conditions of use may be changed in the future without further notice. We make no warranty as to the currency, operability, or fitness for any particular purpose of any freeware software posted to this site, and will assume no liability for any losses or damages alleged to arise from use of or reliance on such software. We undertake no duty to determine the currency, operability, or fitness for any particular purpose of any freeware software posted to this site. There are inherent dangers in the use of any software available for downloading on the Internet, and the Datamath Calculator Museum cautions you to make sure that you completely understand the potential risks before downloading any of the software. You are solely responsible for adequate protection and backup of the data and equipment used in connection with any of the Software, and the Datamath Calculator Museum will not be liable for any damages that you may suffer in connection with downloading, using, modifying or distributing any of the Software. Windows 98, ME, XP, NT 4.0 and 2000 are ready for immediate usage. At least 24-bit color mode settings, prefer 32-bit (true) color setting. Calculator precision differs from the original implementation. Clicking the small TI logo will open an additional window. Use the <F1> key for help. You should be connnected to the internet. The <ESC> key terminates the SR-50 Commemorative. Right-click on the mouse will open Contex-Menue. To "uninstall" SR50.EXE, just delete the program from your harddisc drive. It has no side-effects at all that would require "uninstalling" in the normal sense. During evaluation of the SR-50 Commemorative Software we noticed some incompatibilities with elder Windows NT 4.0 installations. Some Windows 2000 installations showed a red rectangular surrounding the SR-50 calculator. Barbara G. Woerner Creating the design and layout of the online User-guide. Herb Foster Providing the continual support for the Datamath Calculator Museum and the SR-50 Commemorative project. © Joerg Woerner, October 26, 2003. No reprints without written permission.